I (Ethan Sawyer, College Essay Guy) love it when articles and conference presentations offer a few take-away gems. But why not just create a presentation with *only* the gems, I thought? So I reached out to some of my favorite counselors and asked for their best essay tips and—voila!—this document came into existence. I’m grateful to the following folks for making important contributions to this article: Evelyn Alexander, Casey Rowley, Piotr Dabrowski, Chris Reeves, Susan Dabbar, Noah Kagan, Devon Sawyer, Josh Stephens, Lisa Kateri Gilbode, Randolf Arguelles. Problem 1: How can I build rapport with my students more quickly? 1-Minute Solution: On your intake form, ask students to name a band or musician they're listening to lately. Then, when they come in for their one-on-one session, have that artist playing on Pandora. Pro-Tip: Get Pandora One for just $3.99/mo to avoid getting interrupted by annoying ads. For more ideas, check out this list of 100 Brave and Interesting Questions. Problem 2: How can I keep students engaged during a three-day essay boot camp (and even get kids to talk about my sessions long after the fact)? Pro Tip: Ask attendees if they have allergies. If so, research the best snacks that won't kill anyone. During multi-day essay workshops, I (Ethan) like to break things up after lunch on the second day with a mini Myers-Briggs assessment. How? First, I’ll introduce MBTI—what it is, how it was developed. Then I’ll give students a brief Myers-Briggs assessment by going through the preferences and having them self-select as they look at this chart. (I do this with lots of jokes and personal examples.) Next I’ll have them go to www.16personalities.com, take a brief assessment, and see what resonates. We spend 10 minutes or so on this, as it’s a great energizer, then we dive back into the essay work. Problem 3: What are some ways to beat writer’s block? 1. Move: Put on your headphones, blast your favorite tunes and talk a walk. Rake some leaves. Shake it loose with movement. Remember physics? Momentum will create new energy. 2. Play: Toss a ball with a friend. Color in one of those cool adult coloring books, grab a hunk of clay and mold something. Get dirty and tactile. 3. Motivate: As Elizabeth Gilbert says in her TED talk, you’ve got to sit down at the keyboard and invite the muse to show up. In short, don’t wait for your moment of inspiration; create it. Or give your perfectionism a rest and give yourself permission to “get a B+”. 4. Freewrite: Don’t necessarily start at the beginning and try not to overthink things. Do think randomly. Begin with a raw, non-linear, brain-dump. Or try writing morning pages. If writing or typing slows you down, use a dictation app like Dragon. Problem 4: I just want to record a quick video (for example, to show a student where to click on a particular website) but I don’t want to go through the hassle of setting up a camera, etc. 1-Minute Solution: Use Jing to record a quick video of your screen, then share it via Screencast.com. Jing is here. Or record directly from your Mac using QuickTime (no download needed)! To record from Mac: Open your Applications folder to find QuickTime (or use Spotlight). Once it's open, go to File > New Screen Recording and then click the Record button. You can choose between recording a portion of your screen or the entire screen. QuickTime tutorial is here. Problem 5: Sometimes I just want to explain something quickly but I'm afraid it will take me too long to type it out and I'd rather not schedule a whole session with a student to explain a small thing. What should I do? 1-Minute Solution: See above! Record notes via video and then share it via Google Drive. Problem 6: I have a student who seems to forget everything we talk about in our sessions. What can I do? 1-Minute Solution: Refer that student to another counselor! (Kidding.) Try Skype Call Recorder. Record the session in dual screen and then drag the file into a Google Drive folder with that student’s name on it, so that student can go back and remember what you discussed. You can record sessions remotely or in person. Heads-up: This will start to take up a lot of space, so you’ll want to be diligent about dragging those files onto a separate hard drive and deleting them from your computer. Bonus tip: One back-up drive isn’t enough. You need a back-up drive for your back-up drive that doesn’t live in the same place as your first back-up (i.e. your home/office). Keep a second back-up of your files elsewhere—perhaps on the Cloud. I recommend getting two of these. They’re inexpensive and haven’t failed me. I also back everything up on Google Drive. Problem 7: I’m worried about liability with my students. We get pretty personal and I’m not 100% certain what might happen, but I just want to cover myself. 1-Minute Solution: Record your sessions. How? As mentioned above, record remote sessions via Skype Call Recorder or in-person sessions with the Quicktime method. Problem 8: Sending drafts back and forth via microsoft word seems to take too long. (OR) I’m tired of typing in all caps. Restoring an earlier version of a document. Changing your status from “Editing” to “Suggesting” in the upper right corner. Click here for 24 more Google docs hacks that teachers (and counselors!) should know, including How to Create and Organize a Table of Contents. Problem 9: How can I help keep students from missing sessions or coming without homework finished? 1-Minute Solution: Set up text reminders with AppToto. Problem 10: How can I help my students avoid cliché language? Idea #1: When you re-reading an essay draft, highlight all the clichés. Take as long as you need to replace them with expressions of your own phrasing. Even if your phrasing doesn't seem as "clever" or "eloquent," the essay will instantly become stronger and more genuine. Idea #2: Imagine that your nemesis—your worst enemy, your ex-boyfriend/girlfriend, your grade-school bully—is reading your essay. Highlight the parts that they would pick up on as being unconvincing, confusing, not credible, melodramatic, or disingenuous. Then strengthen it accordingly by making it more honest, more clear, more realistic, and more grounded. Problem 11: How do I let students know that they are driving this process and I am the navigator? 1-Minute Solution: Lisa Kateri Gilbode gives each student a set of pilot wings. “They become sort of like their superhero capes,” she says, “And when we meet they wear their wings and it reminds them that they are in the lead.” Get sets of 10 pilot wings on Amazon for $18.88. Problem 12: How can I be sure I'm listening more than talking in my one-on-one sessions with students? 1-Minute Solution: Along with their pilot wings, Lisa’s Gilbode’s students get a cricket clicker and because they are in the lead they get to click it when I do more of the talking and less listening. Get 12 clickers on Amazon for $6.08. Problem 13: How can I help parents feel they have contributed during the essay-writing process but still keep healthy boundaries? 1-Minute Solution: At the start of the process, have parents complete a set of parent homework questions, which offers them a chance to feel heard and, in some cases, dump all of their hopes and fears. Then ask: Anything else? Then say (to those parents who want to be CC'd on drafts): “Sorry, we don’t do that, as we worry about too many cooks in the kitchen” (OR) “we like to make sure the student is really in the driver’s seat.” Then say, “I’d love to give the student a chance to work on the essays for a while with me, and we’ll check back in for feedback once the essays are in a good place and the student is ready.” Note that this questionnaire can be just 10 good questions long. Pro Tip: I (Ethan) give parents the Values Exercise and have them complete it, then say, “Once finished, please list the top three values that you’d like to impart to your son/daughter, with a brief explanation.” Why do this? It 1) can help parents feel more connected to the process, 2) offers parents a sense of what exercises their student will be doing, 3) sometimes sparks neat conversations within the family. Problem 14: I’m an independent counselor and I want more people to know about me and the great work I do with my students! 1-Minute Solution: Check out Sujan Patel’s “100 Days of Growth” PDF. For the first 26 pages, click here. To purchase the rest for $27 (and it’s worth much, much more), click here. Problem 15: I’m an independent counselor and I really have no idea if my marketing is working or not! 1-Minute Solution: Do you have as many clients as you want? Great, you’re done! If not, use Dorie Clark’s Recognized Expert Evaluation Toolkit, which has great ideas for creating content, establishing social proof, and building your network, plus it has a self-assessment to help you rate how you’re doing. Problem 16: How do I get my students to show and not tell? 1-Minute Solution: Have your students write down a list of adjectives that they want the colleges to know about themselves. Then tell the students they are not allowed to use those adjectives in their personal statements. Instead, make them tell stories that will force the reader to conclude that the students have those qualities. This takes practice, but great writing is rewriting. Problem 17: How do my students know if their personal statement is personal enough? 1-Minute Solution: (Speaking to a student) Get together with a group of friends after you've written your first drafts of personal statements. Don't put the authors' names on the drafts. Mix them up and pass them around. Your friends should be able to tell which draft you wrote. If they can’t, your personal statement may not be personal enough. 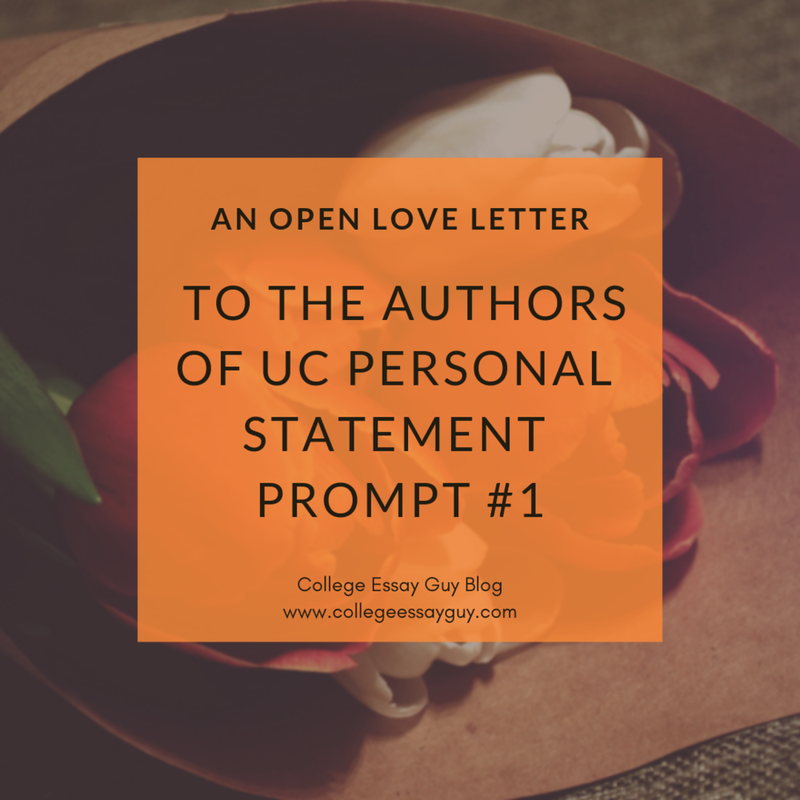 Problem 18: I want to show my students good examples of personal statements, but I don't want to show them college application personal statements because I’m concerned they might just copy the structure and content of the examples. Where can I tell them to look for good examples of non-college app personal statements? 1-Minute Solution: Check out NPR’s This I Believe. Pro-Tip: Some teens like the piece by pro skateboarder Tony Hawk. Problem 19: How can I get my procrastinating student(s) to focus for just 25 minutes on an essay draft? 1-Minute Solution: Have them download the Tomato One app, which is a simple timer that counts down from 25 minutes. It dings, then gives a five-minute break, then counts down another 25 minutes. Note that this has been responsible for all of my most productive days. Problem 20: How can I liven up a boring/CLICHÉ essay topic? 1-Minute Solution: Play the UC (Uncommon Connections) Game. All will be explained on that page. Problem 21: How can I improve an essay in just one minute? Which values are coming through really clearly in the essay? Which values are kind of coming through but could be coming through more clearly? Which values aren’t there yet but could be? For more: Watch the Great College Essay Test. Problem 22: How do I get students to come up with interesting topics for the “intellectual vitality” supplemental essay (for Stanford, and other schools)? 1-Minute Solution: Check out this Google spreadsheet with every TED talk ever. Have students search for topics that interest them (e.g. neuroscience, climate change) and then binge watch some TED talks. Problem 23: Tired of pestering a student who won’t respond to deadlines and is constantly making excuses? 1-Minute Solution: Outsource the pestering by hiring a personal coach via Coach.me. For as little as $65/mo, the student gets unlimited emails and in-app communication. This has positively changed the game for a couple of my students—and either you can suggest it to parents and let them pay the cost or work it into your fee, as I do (it’s worth it!). I recommend Kendra. Problem 24: The majority of my students are overseas and work with me online. How do I create a welcoming environment when we are not working in person? 1-Minute Solution: On the intake form, ask where their happy place is. Where does the student feel most empowered, comfortable and/or creative? Then use green-screen technology to create that space in my location. How? Use Zoom Meeting Pro which has built-in chromakey technology ($14.95/mo for a single host). You can also use WeVideo, which is a bit more finicky, but some students overseas don't have the power to support Zoom. Problem 25: What do I do when a student is incredibly anxious about essays/college admissions/testing, etc? A. Check-in at the beginning of the meeting. Often we have a small window to meet with students and when they come in we’re not really sure where they are mentally before diving into a conversation about their future, which often involves heavy self-reflection/decision making. It can be incredibly helpful to “check-in” with a student for literally 30 seconds to see where they are mentally. B. Stop Breathe Think is an app and website with short meditation and mindfulness resources. On their homepage you can complete a few questions and add your mood/feelings and it will give you suggestions on everything from gratitude, to short meditations, breathing and journaling. I’ll ask a student to do one of these exercises between now and the next time we meet and then I’ll follow up with their experience. C. Listen to the most relaxing song ever. Or click here for a guided meditation I created using that song as background. Problem 26: How can I improve every essay workshop I give… in just one minute? And that’s just what I did for this article… I wanted you to know a wide range of tools, tips and tricks. I wanted you to feel informed, energized and inspired. I wanted you to return to your work with more ease, purpose and joy. So go do that now. Spread comfy pillows on the floor of your office! Ask students to pick three (and only three!) people to receive feedback from. Write three drafts and ALWAYS start fresh each time. For students who feel they can’t write *anything*, have them write for one minute, then count the words they wrote and ask, “Could we do a few more in the next minute?” Build little wins. My favorite: Use the visual mind-mapping tool called coggle.it , which helps students create an outline in just a few minutes. You're in love, aren't you? prove it. partner with us! My colleagues (Evelyn Alexander and Casey Rowley) and I spent several weeks in early 2017 asking some of the best counselors in the land for their best advice. We curated their top tips and presented the best ones at the WACAC and HECA conferences. Then we thought: Why not share these more widely? So that’s what this is: 25+ tips to improve your counseling life. Why the plus sign? That’s where you come in. Please add your best 1-minute idea in the comments below! Links encouraged. Please add your ideas in the comment section--and feel free to use the format we’ve used below. Problem 1: You meet with a student and they are incredibly anxious about college admissions/testing and the entire process. How do you dive into your meeting (especially when you have limited time with the student), but ensure that the student is ready for a bigger conversation? Check-in at the beginning of the meeting. Oftentimes we have a small window to meet with students and when they come in we’re not really sure where they are mentally before diving into a conversation about their future that involves heavy self-reflection/decision making. It can be incredibly helpful to “check-in” with a student for literally 30 seconds to see where they are mentally. This can be done with a simple check-in question such as, “If you could put your mood into a weather, what kind of weather would you be? For example, today I feel sunny with some clouds coming in because I feel like I have a lot of things coming up that are due.” Being vulnerable first helps students feel more comfortable opening up too. In groups, something as simple as stretching for 1 minute can make a big difference. Stop Breathe Think is an app and website with short meditation and mindfulness resources. On their homepage you can complete a few questions and add your mood/feelings and it will give you suggestions on everything from gratitude, to short meditations, breathing and journaling. I’ll ask a student to do one of these exercises between now and the next time we meet and then I’ll follow up with their experience. Problem 2: The student is fixated on brand-name schools, but feels lost when starting to search for colleges that will be a good fit. We ask students to do research on colleges that fit their wants/needs and values, we preach college fit, but what is an easy clear way to get a student to see what they want? 1-minute solution: Draw your own college. This is an exercise to challenge students to draw a bird’s eye view of their own dream college. The guided exercise has the student draw everything from the student union to resources and clubs on campus, classroom size, curriculum and environment outside of the classroom. Students are able to visually imagine the things important to them in a college. Have the student take a picture or keep it in their file so when you are meeting with them later on you can remind them of their picture when they get fixated on a college that doesn’t really make sense. Problem 3: The college application process has so many steps! How do you help students keep track, not procrastinate and stay focused? 1-minute solution: Help them break it up into manageable pieces. Encourage them to write a list of short, attainable goals for the week, month and semester. They can write goals in their phone and set reminders that will pop up on their screen. Ex. “By the end of this month I will take my SAT and start to research my colleges list. By the end of summer, I will have first drafts of my UC essay written and a complete college list with deadlines.” Encourage students to write goals in a place that works best: notes on iPhone, in a notebook, calendar, etc.--whatever they’ll actually look at. Problem 4: If a student can’t visit the college and is trying to get a sense of the campus environment. (urban, secluded, etc.) Or if they are having a hard time getting to know a college that they haven’t really heard of and are unable to visit. 1-minute solution: Use Google Maps and virtual tours! This one might seem out of place, but I promise it’s a powerful tool. It can be hard to have faith that a college is a good “fit” for you when you have never visited the campus. Google maps has the amazing ability to help create a vision of not just the campus, but its surroundings and context. Put the university in the search engine and zoom out a little. What do you see? Museums? Mountains? Access to a metro station that takes you into town? Where is the closest airport? What is the population of the town around campus? What does the closest town have? Also use virtual tours to get an interactive experience as if you were there! Problem 5: Families get the award letter and are shocked, angry, surprised. How do you get them to research earlier with tools that will work? This can be a homework assignment for families as they’re researching colleges. They key is to get them to utilize these resources earlier. Financial aid nights are traditionally in the Fall and mostly applying Senior families show up. Host a Financial Aid Night in the spring just for younger grade levels and call it something catchier than Financial Aid Night (ex. How Colleges Can Be More Affordable Than You Think). Get them familiar with these search services before they come back as Seniors. Problem 6: Time management for homework. Students are inundated with hours of homework. After getting home, after completing extracurriculars, the time it takes to complete homework can be insane. How do you study smarter, not harder? 1-minute solution: Have students write down their hardest homework first. Not the longest project, but the subject they struggle with most. Tackle that one first, take a 5 minute snack/social media/zone out break, and then tackle the next toughest subject. Save your easiest subject for the end when it’s 9:00 p.m. – 10:00 p.m. and your brain is fried from a full day. Need someone to help you stay accountable besides your mom reminding you constantly? Check out Coach.me below. Problem 7: Student is having a hard time deciding which college to commit to. 1-minute solution: Magic wand exercise: Keep a magic wand in your office. It's useful at the end of the year, when a student is torn between 2 schools and can't decide. We make a pros and cons list, and if it's dead even (i.e. one is not way more expensive than the other) I take the list away and rip it up in front of them. I tell them that they already know the answer - their body knows. We are going to use magic to get to what the body knows. I take out my wand and wave it over them and say "It's decided, you are going to XYZ University!" and I tell them the spell lasts for 24 hours. They can come back and see me in 24 hours to have the spell reversed if they feel gross/don't sleep in the next day. But now they need to leave, tell people it's decided, and carry on like normal. (Extra bonus points for working out/hiking/singing/dancing or doing whatever else makes them get in the “zone” and out of their head. ) More often than not, they come back and say “I felt great this past day! I'm so happy! I'm going to put down a deposit at XYZ University.” If they come back and say “I feel gross. I had nightmares. I hated saying XYZ University out loud to people.” I reverse the spell and we go with ABC University. 1-minute solution: Use data to help your students and parents gain perspective and a little humility about how competitive these schools are. For example, show your parent/student the image below (which doesn’t even include international applicants!) to illustrate the caliber of other applicants they will be going up against. You don’t have to say much to help them see that there are roughly 40,000 number one students throughout the United States alone. Another 1-minute solution: Tell them this: Colleges are looking for students who will contribute to their campus--who will GIVE as well as take. Think hard about WHY you are a good match for each school. Articulate what you will bring to the community and what you will gain from it. Your chances of being admitted will be higher. Problem 9: Getting students to research more colleges. 1-minute solution: College Research Project. Ideal in a Junior classroom. Each student must choose a college they have never heard of and give a small presentation similar to what a college representative would do(facts, key programs, financial aid, etc.). By the time the presentations are over each student has learned about 20-30 new colleges depending on the class size. Problem 10: Getting students (and parents) to consider great options beyond the UCs and CSUs (and/or they think that the UCs and CSUs are going to be less expensive). 1-minute solution: Use RACC! This is a great group of folks who are experts on helping California students attend out-of-state schools. For school counselors, they will come to your school and conduct mini-college fairs, give presentations and offer case studies. For IECs--heck just give them a call and ask them out for coffee! Problem 11: Student doesn’t know which teachers to ask for letters of recommendation. 1-minute solution: Have juniors read an actual downloaded copy of the teacher recommendation so that they know exactly how teachers are evaluating them. If the school is not a Naviance school or if you’re an IEC, you’ll need to go into your Common App account, if you have one, and enter the FERPA/recommendations section. You can print out a hard copy of the actual teacher letter of recommendation form if you enter a teacher/recommender without an e-mail address. Problem 12: How do I get students to think about their priorities for their college experience (instead of just focusing on the names)? 1-minute solution: Corsava Cards and Cafe. Have students sort cards and choose their Top 10 priorities. Then, they can take a photo with their phone and SEARCH for these things as they research colleges. They’ve identified their priorities--now they can actually look for colleges that fit those priorities! Problem 13: Parents want to drive the whole process. 1-minute solution: Ensure the student knows they have ownership. How? Speak to (and make direct eye-contact with) the student at the end of each session and say “You’re in charge here.” And let the parents see and hear you do this. Keep doing this until they get it. Problem 14: Parents who want to talk about college. All. The. Time. 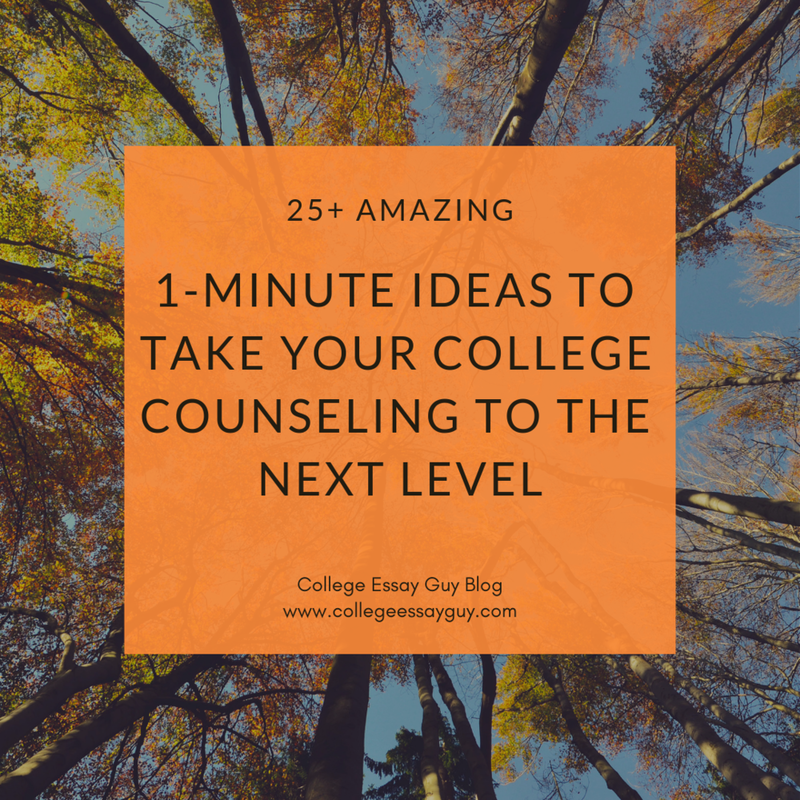 1-minute solution: Set up a weekly time to talk about college and ONLY talk about college then! This is a big problem. From the student’s perspective, their parents (and sometimes relatives--hello, can we talk about something else at Thanksgiving?!) are ambushing them daily. It really accomplishes nothing except to shut teenagers down. Make a game out of it--whoever talks about college first during a non-college time has to buy ice cream for the whole family. Resource: Check out College Essay Guy’s podcast episode with Maria Furtado for more great tips. Problem 15: How do I get 100% of my students to turn in their essays ahead of time without fail? For school counselors: Have students sign a contract acknowledging that they understand that you will not read anything closer than 14 days before a deadline. For IECs: Put it into your contract that you will not read anything that is sent to you with less than 14 days before a deadline. If this is not in your contract, create a document around Labor Day laying out your goals for submission timelines. Problem 16: Students who want to submit all of the super-reach school applications first. 1-minute solution: Don’t! Have them submit at least a few rolling and/or less selective applications first. Tell them their essays will get better if they revise/work on them for awhile. Why? So you can get a couple acceptances early! Save some of the harder ones (NOT ALL!) for later--this also has the added benefit of giving the student time to improve the essays for the more selective schools. Problem 17: Students who want to submit all of their super-reach schools a minute before the deadline. Tell them squeezing 27 essays into a week’s time is not going to yield super-awesome essays that really tell their story. Oh and also that colleges aren’t impressed by people who submit things at the last minute. Resource: College Essay Guy’s “Why Us” series. Note: these final tips will repeat from the essays-only version of this session/blog post. You can check out the rest of the tips at this link. Problem 19: How can I build rapport with my students more quickly? Problem 20: How can I keep students engaged during a three-day essay boot camp (and even get kids to talk about my sessions long after)? Problem 21: I just want to record a quick video (for example, to show a student where to click on a particular website) but I don’t want to go through the hassle of setting up a camera, etc. Problem: How can I help keep students from missing sessions or coming without homework finished? Problem 22: How can I help my students avoid cliché language? Idea #1: When you’re re-reading an essay draft, highlight all the clichés. Take as long as you need to replace them with expressions of your own phrasing. Even if your phrasing doesn't seem as "clever" or "eloquent," the essay will instantly become stronger and more genuine. Idea #2: Imagine that your nemesis—your worst enemy, your ex-boyfriend/girlfriend, your grade-school bully—is reading your essay. Highlight the parts that they would pick up on as being unconvincing, confusing, not credible, melodramatic, or disingenuous. Then strengthen it accordingly by making it more honest, clearer, more realistic, and more grounded. Problem 23: How can I get my procrastinating student(s) to focus for just 25 minutes on an essay draft? Problem 24: How can I liven up a boring/cliché essay topic? Problem 25: How can I improve an essay in just one minute? Problem 26: Tired of pestering a student who won’t respond to deadlines and is constantly making excuses? For students who feel they can’t write *anything*, have them write for one minute, then count the words they wrote and ask, “Could we do a few more in the next minute?” Creating little victories can build confidence. Use the visual mind-mapping tool called coggle.it, which helps students create an outline in just a few minutes. Freewrite: Don’t start at the beginning. Don’t overthink things. Do think randomly. Begin with a raw, non-linear, braindump. Try writing morning pages. And if writing or typing slows you down, use a dictation app like Dragon. Play: Toss a ball with a friend. Color in one of those cool adult coloring books, grab a hunk of clay and mold something. Get dirty and tactile. Move: Rake some leaves. Shoot free throws. Or just put on your headphones and talk a walk. Remember physics? Momentum will create new energy. You're probably right! So here are: Fourteen Amazing Google Docs Hacks and 20 more Google docs hacks that you may not know about. Have a 1-minute tip or resource you’d like to share? Looking for a complete college readiness solution? GATE’s curriculum targets the four mission critical areas of post-graduation success as encompassed in the GATE acronym: Grades, Applications, Testing and Essays. GATE supports and equips students so counselors and teachers know they are fully prepared with a one-stop-solution for college and career readiness. Like what you've seen so far? there's more where that came from. partner with us! 1. Provide hope & encouragement. Reassure undocumented students that college is possible, despite the obstacles. 2. Drop the “I” word. Instead of the word “illegal,” use the words “undocumented” and “dreamers.” Help change the immigration discourse. 3. Make information and resources available for ALL students. Don’t require students to self-identify in order to access information. Many students will be scared to reveal their immigration status or they may not know their status. 4. Be open-minded. Don’t make assumptions about who may or may not be undocumented. Undocumented youths aren’t all Latino, Spanish-speaking, or enrolled in ENL classes. 6. Support pro-immigrant federal, state and city legislation such as the federal DREAM Act, the IL Dream Act, in-state tuition IL Public Act 93-007. 7. Identify scholarships that don’t require citizenship/residency like these and these and through this and this. 8. Advocate for scholarships and private colleges to allow undocumented students to apply and enroll. 9. Involve parents. Educate the parents of undocumented students as to the benefits of a college education. 10. Help create lasting support networks that can offer ongoing mentoring and advice for undocumented youth. 12. Identify role models: undocumented youth and/or college graduates from the community to give a presentation to inform, empower and share resources. 13. Reach out to organizations, community groups that can support undocumented and immigrant youth, or create a club that supports undocumented students. 14. Make your school/ classroom a safe haven for undocumented youth. Post a sign in your classroom that states that you support undocumented students and their dreams!